If you're enchanted by the story of King Arthur, Merlyn, Guinevere, her ladies and the Knights of the Roundtable, then Young King Arthur will transport you to legendary England where all these young characters come to life. Carolina Children's Theatre is delighted to bring another classic tale to the stage in this original adaptation of the "Sword in the Stone" legend. Young King Arthur begins in the contemporary world following 3 kids - Art, Lance and Gwen - living in Cornwall, England. They encounter a classmate, Emrys (aka Merlyn) at the town festival after learning of Morgan & Morty's secret greedy plan to destroy the beauty of their small town on the seaside. Not sure what to do, they accept Emrys' invitation to embark on an adventure - an epic journey that will show the schoolchildren how anyone can right wrong - no matter what your age - and stop the wicked M&M Construction. They, of course, are magically transported back in time 1500 years to the Dark Ages in a kingless England and to a castle where Sir Ector and his son Kay dwell. Lance and Gwen are mistaken for servants in the castle while Art is now Wart - Kay's lowly squire-in-training. Not one of the brave knights was ever able to pull the sword free until it is Wart who accidentally pulls the sword from the stone and there is no doubt he is the true King of England. Armed with his new knowledge, Lance, Gwen and Art and magically transported once again to modern day Cornwall. This time, however, they are armed with what they need to defeat Morgan and Morty and save their town from environmental destruction. 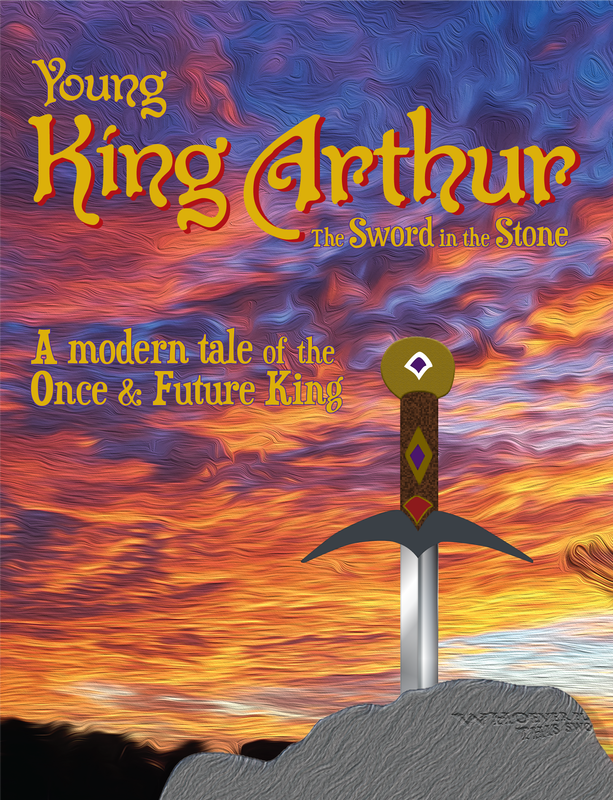 This new adaptation of the tale of King Arthur is written by Christina Cass Catton, Artistic Director of Carolina Children's Theatre and will be premiered at the Holly Springs Cultural Center in May 2019! Open to children and youth ages 6-14! All auditions, rehearsals and performances take place the Holly Springs Cultural Center, 300 West Ballentine St., Holly Springs. If you are registered in the class, you are in the show! Auditions help us decide what role each child will play. Once you are registered for this production class, you will be assigned an audition time for Mon. Feb.11. The audition times and class information will be sent out at the same time the week of Feb. 4. ​Callbacks are on Tues. Feb. 12. Please put aside that evening in case your child is asked to return - please note that not all children are requested to return for the second day! Mon. & Tues., Feb. 11-12 @ 6pm. Fri., Feb. 15 @ 5-7pm. NOTE: NO rehearsal Easter wknd, Apr. 20. Mon.-Weds. Apr. 29-30 & May 1 @ 5pm-8pm. Cast party following the Sat. matinee. A $60 production fee is payable in cash or check to the instructor on the first day of rehearsal. This is used to help pay for costumes, sets, scripts, props, etc. needed to put on an awesome show! Cool show t-shirt, CCT workbook and folder included with every registration. Please note that this show relies HEAVILY on the time and talent of parent volunteers. We encourage ALL parents to help in some way. Backstage, marketing, costumes, props, sets or raffles are just some of the ways we need help to make the show a great experience for all. If you have any questions, please feel free to contact the director, Christina, at carolinachildrenstheatre@gmail.com. ​Sorry! This class is now Full. Please join our mailing list to be notified of upcoming shows, classes and camps!